Cannabis is well known for its psychoactive effects, causing temporary changes in visual and auditory perception. The cannabis plant is also a rich source of medicinal compounds. Cannabinoids related to THC exert medicinal action through the endocannabinoid system — a critical component of homeostasis. Many of these cannabinoids aren't psychoactive, and wont produce the 'high' associated with the plant in their isolated forms. Compounds like CBD, have become especially popular as a supplement recently for its broad medicinal benefits. There are plenty of uses for cannabis — however, product selection, strain choice, and cannabinoid profiles make a big difference in the effects produced by the plant. It's important to use the right type of cannabis for the job. What is Cannabis Used For? Only use cannabis medicinally following the direction of a qualified medical practitioner. Caution with anxious or depression. Avoid use alongside medications unless first discussing with your doctor. Using cannabis as medicine poses challenges due to the large variety of effects each cannabinoid possesses. Different cannabinoid and terpene ratios can produce different effect profiles. The plant has many claimed benefits, and though a lot of them can be validated, it's not a miracle plant. Using cannabis as medicine should be attempted with caution due to the degree of variability the plant produces in terms of effect profile. What this means is that some cannabis extracts will make symptoms like anxiety worse, while others can dramatically improve it. Choosing the right strain or extract is of the utmost importance when using cannabis as medicine. These effects all contradict themselves in most cases. The reason this happens is because the cannabinoids work through a regulatory pathway (endocannabinoid system) rather than on a particular organ function. It's similar to how adaptogens like ginseng, ashwagandha, or reishi produce often contradictory or bidirectional results. Avoid use while pregnant and nursing. Long-term use acceptable. Recommended to take breaks periodically. Cannabis plants are members of the Cannabacea family. This small family comprises only 11 different genuses, and about 170 species. Some common members of the family are hops (Humulus spp.) and celtis (Celtis spp.). The celtis genus contains the largest collection of species by far, with over 100 different species. Cannabis and Humulus are the closest related genus' in the group by far. 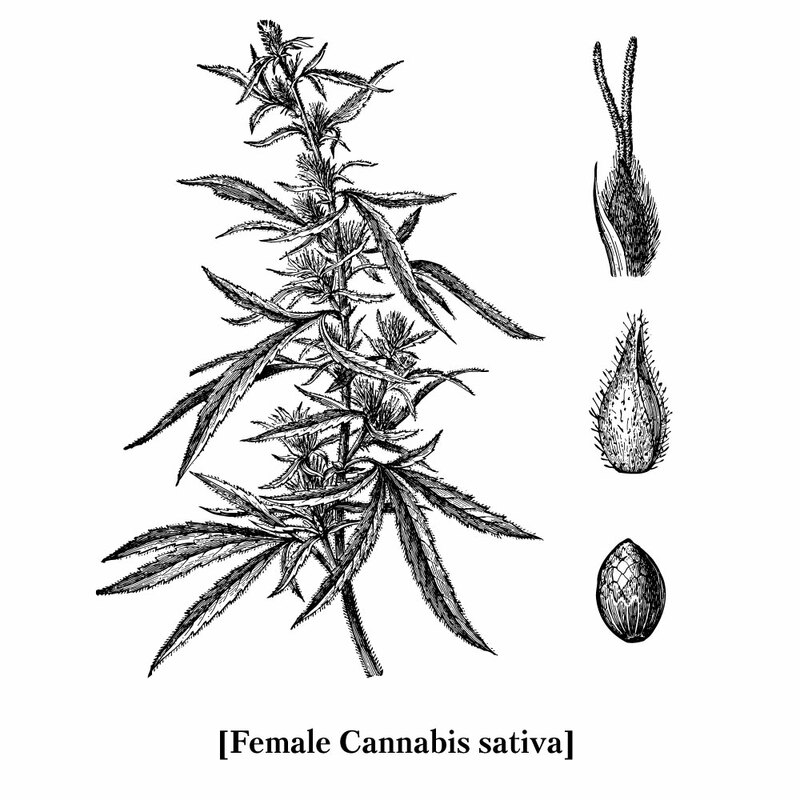 Cannabis sativa is a tall, fibrous plant. It's high in cannabinoids, terpenes, and other phytochemicals — giving it many uses medicinally. Cannabis sativa is the most commonly cultivated species. There are hundreds, if not thousands of different phenotypes of this species — the most important being hemp — which is a non-psychoactive, high fiber plant valued as both a health supplement and textile. It's also used for food (seeds), and to make biodeisel. There are also Cannabis sativa strains high in the psychoactive component — THC — which make it popular as both medicine and recreational intoxicant. Cannabis indica grows as s shorter, bushier plant. It's hgiher in THC, and there are few low-THC phenotypes available for this plant. This species of cannabis is most often used recreationally. Cannabis ruderalis is a small, herbaceus plant more closely related to Cannabis sativa than Cannabis indica. It's low in cannabinoids, and terpenes, as well as fiber — limiting its value to humans. This species has the unique ability to initiate flower production irrelevant to day length. Plant breeders have started mixing the plant with other species to gain these benefits. This makes cultivation easier in areas where day length is too short or too long for optimal cannabis cultivation. There are 421 compounds in the cannabis plant , at least 66 of these are cannabinoids — some sources report as many as 112. The top 6 cannabinoids in the plant (CBD, CBG, CNN, THC, THCV, and CBC), account for the vast majority of the cannabinoid profile. The phenotype of the cannabis used is the primary determining factor for the cannabinoid profile of each plant. Hemp plants for example, contain much higher levels of CBD, and lower levels of THC. Marijuana strains are the opposite, contianing high THC, and lower CBD. Depending on the strain, this can vary dramatically — and you can find almost any combination of cannabinoid possible. Cannabinoids are a class of phytochemical compounds resembling the structure of our naturally occurring ecosanoid endocannabinoids; anandamide, and 2-AG. There are roughly 66 of these compounds in the cannabis plant, and a few found in other species of plants as well — such as helichrysum and echinacea. Although the cannabinoids are very similar, their binding activity varies a lot . Some bind to CB1 receptors (located primarily in the central nervous system), others bind to CB2 receptors (found primarily in immune tissue). Some cannabinoids will even bind to both, or work by increasing the concentrations of naturally occurring endocannabinoids instead. Due to the wide range of variability between each cannabinoid, it’s useful to go over them in greater detail individually. CBC is the third most abundant cannabinoid in the cannabis plant. CBC is far less studied than the two preceding cannabinoids CBD, and THC, though early research is starting to suggest it’s even better for treating conditions like anxiety than the famed CBD. CBC content can be increased in the cannabis plant by inducing light-stress on the plant . In many cases, CBD is the most abundant cannabinoid. Only selectively bred cannabis strains will have higher THC concentrations than CBD. CBD is famed for many reasons. It offers a wide range of medicinal benefits, and has been well-studied and validated over the past two decades. CBD oils, e-liquids, and edibles have become highly popular in recent years as more of this research is being released and translated for the general public. CBG is an early precursor for many of the other cannabinoids including THC. Plants harvested early will be high in this compound. Many users report that strains high in CBG are less likely to cause anxiety, and are good for people experiencing acute stress. This is likely due to its role in blocking the serotonergic effects of THC through the 5-HT1A serotonin receptors . CBN is made from THC. As THC content breaks down with time, or heat, CBN levels increase overall. Older harvested plants that have gone past their window of ripeness will be much higher in CBN. It’s mostly non-psychoactive but may have some mild psychoactivity in some people. Products or strains high in CBN will produce more of a heavy feeling and are best used for treating conditions like insomnia or anxiety. This cannabinoid is potentially the most sedative of the group. THC is the main psychoactive compound in the cannabis plant. THC activates both CB1 and CB2 endocannabinoid receptors, causing changes in neurotransmitters like dopamine, norepinephrine, and most importantly, serotonin. It’s this change in neurotransmitter levels that produce the bulk of the high experienced by this compound. Aside from its psychoactive effects, THC has medicinal benefits of its own. It’s mentally stimulating and has some potent antidepressant effects through its euphoric effects. PPAR gamma receptor agonist [11, 15]. THCV is the fraternal twin of THC. It’s virtually identical except for one slight chemical difference — THCV is missing two carbon atoms. This makes the effects of THCV very similar to THC — but is much weaker in its effects. One study reported THCV as being 20-25% as strong as THC in its psychoactive effects . There are others affected by this, including CBCV, and CBDV, though they are in far less concentrations. Vanilloid receptor agonist (TRPV3 and TRPV4) . There are also a lot of cannabinoids that can be found in much lower concentrations. These make up the bottom 5% of the cannabinoid profile. Few of these cannabinoids have many studies on them aside from chemical mapping to identify their structure. We may see more research on these cannabinoids in the near future. There are also synthetic cannabinoids. These are compounds that are similar in shape and function to cannabinoids produced in our bodies, or in the cannabis plant. It’s recommended that you stay far away from the synthetic cannabinoids — not only do they lack many of the medicinal actions of cannabis, they have the potential to cause serious harm. The street drug known as “spice” is a combination of various synthetic cannabinoids. They were designed as an attempt to circumvent the legal hurdles preventing the sale of cannabis products for recreational use — and have since become a major cause of addiction and abuse. Terpenes are a class of compounds characterized by their volatile nature, and hydrocarbon-based structure. These are contained in high amounts in the essential oil of plants. Terpenes have a very low molecular weight, and will evaporate under low temperatures. This, combined with their characteristic aromas is what gives many plants their scent. Conifer trees, fruits, and many flowers (including cannabis) all owe their aroma to their terpene profile. Each plant can contains hundreds of different terpenes — many of which will even overlap into unrelated plant species. Cannabis shares terpenes with pine trees, many different flowers, citrus fruits, and nutmeg, among others. Terpenes add flavor as well as additional medicinal benefits. Terpenes often have antibacterial, antiviral, antinflammatory, and anxiolytic effects. Cannabinoids work by mimicking the endocannabinoids anandamide and 2-AG. Learn more about cannabinoid metabolism. As an herb, cannabis is very useful. It works through a set of receptors most other plants don’t interact with — the endocannabinoid system. The endocannabinoid system plays a major role in maintaining homeostasis. This gives cannabis an effect profile similar to adaptogens — but through different mechanisms. Cannabis is similar to adaptogens in that it offers a bidirectional effect profile — which means it can both increase, and decrease tissue function according to its homeostatic baseline. But cannabis isn’t quite an adaptogen because it can’t increase the bodies resistance to stress, and doesn’t appear to exert any action on the hypothalamus or adrenal glands directly. Although cannabis has broad actions and therefore can provide benefit to a wide range of body systems — choosing the right product, strain, and phenotype for the job is critical. An experienced herbalist or naturopath using cannabis will take into account the cannabinoid profile, terpene content, and anecdotal effects of each strain or CBD product being used. Unlike other herbs, you have to be very particular about the type of cannabis being used for each condition. There’s a big difference between using cannabis because “it’s healthy”, and using it as a therapeutic agent aimed at treating a specific disease process. Although it can be used as both, daily supplementing cannabis or extracts like CBD don’t constitute medical cannabis. However, you can use cannabis to address the symptoms, or underlying causes for some conditions. Caution advised whenever using cannabis due to the potential for intoxicating side-effects. Without careful consideration of cannabinoid profile, some strains, or cannabis products may make symptoms for certain conditions worse — especially anxiety, psychosis, bipolar disorder, and insomnia. Aizpurua-Olaizola, O., Soydaner, U., Öztürk, E., Schibano, D., Simsir, Y., Navarro, P., ... & Usobiaga, A. (2016). Evolution of the cannabinoid and terpene content during the growth of Cannabis sativa plants from different chemotypes. Journal of natural products, 79(2), 324-331. Shevyrin, V. A., & Morzherin, Y. Y. (2015). Cannabinoids: structures, effects, and classification. Russian Chemical Bulletin, 64(6), 1249-1266. De Petrocellis, L., Orlando, P., Moriello, A. S., Aviello, G., Stott, C., Izzo, A. A., & Di Marzo, V. (2012). Cannabinoid actions at TRPV channels: effects on TRPV3 and TRPV4 and their potential relevance to gastrointestinal inflammation. Acta physiologica, 204(2), 255-266. De Meijer, E. P. M., Hammond, K. M., & Micheler, M. (2009). The inheritance of chemical phenotype in Cannabis sativa L.(III): variation in cannabichromene proportion. Euphytica, 165(2), 293-311. Nelson, K., Walsh, D., Deeter, P., & Sheehan, F. (1994). A phase II study of delta-9-tetrahydrocannabinol for appetite stimulation in cancer-associated anorexia. Journal of palliative care. Bisogno, T., Hanuš, L., De Petrocellis, L., Tchilibon, S., Ponde, D. E., Brandi, I., ... & Di Marzo, V. (2001). Molecular targets for cannabidiol and its synthetic analogues: effect on vanilloid VR1 receptors and on the cellular uptake and enzymatic hydrolysis of anandamide. British journal of pharmacology, 134(4), 845-852. De Petrocellis, L., Vellani, V., Schiano-Moriello, A., Marini, P., Magherini, P. C., Orlando, P., & Di Marzo, V. (2008). Plant-derived cannabinoids modulate the activity of transient receptor potential channels of ankyrin type-1 and melastatin type-8. Journal of Pharmacology and Experimental Therapeutics, 325(3), 1007-1015. Cascio, M. G., Gauson, L. A., Stevenson, L. A., Ross, R. A., & Pertwee, R. G. (2010). Evidence that the plant cannabinoid cannabigerol is a highly potent α2‐adrenoceptor agonist and moderately potent 5HT1A receptor antagonist. British journal of pharmacology, 159(1), 129-141. Farrimond, J. A., Whalley, B. J., & Williams, C. M. (2012). Cannabinol and cannabidiol exert opposing effects on rat feeding patterns. Psychopharmacology, 223(1), 117-129. Pertwee, R. G. (2008). 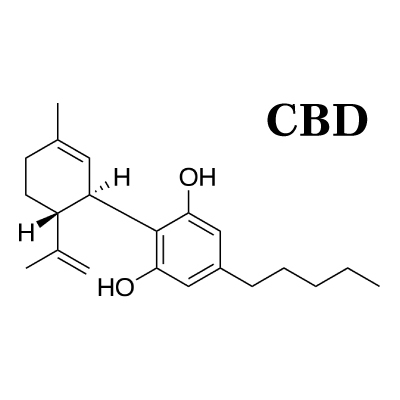 The diverse CB1 and CB2 receptor pharmacology of three plant cannabinoids: Δ9‐tetrahydrocannabinol, cannabidiol and Δ9‐tetrahydrocannabivarin. British journal of pharmacology, 153(2), 199-215. Hollister, L. E. (1974). Structure-activity relationships in man of cannabis constituents, and homologs and metabolites of Δ9-tetrahydrocannabinol. Pharmacology, 11(1), 3-11. Pertwee, R. G. (2006). The pharmacology of cannabinoid receptors and their ligands: an overview. International journal of obesity, 30(S1), S13. Compton, D. R., Rice, K. C., De Costa, B. R., Razdan, R. K., Melvin, L. S., Johnson, M. R., & Martin, B. R. (1993). Cannabinoid structure-activity relationships: correlation of receptor binding and in vivo activities. Journal of Pharmacology and Experimental Therapeutics, 265(1), 218-226. Burstein, S. (2005). PPAR-γ: a nuclear receptor with affinity for cannabinoids. Life sciences, 77(14), 1674-1684.García-Arencibia, M., González, S., de Lago, E., Ramos, J. A., Mechoulam, R., & Fernández-Ruiz, J. (2007). Evaluation of the neuroprotective effect of cannabinoids in a rat model of Parkinson's disease: importance of antioxidant and cannabinoid receptor-independent properties. Brain research, 1134, 162-170. Martín-Moreno, A. M., Reigada, D., Ramírez, B. G., Mechoulam, R., Innamorato, N., Cuadrado, A., & de Ceballos, M. L. (2011). Cannabidiol and other cannabinoids reduce microglial activation in vitro and in vivo: relevance to Alzheimers′ disease. Molecular pharmacology, mol-111. Dirikoc, S., Priola, S. A., Marella, M., Zsürger, N., & Chabry, J. (2007). Nonpsychoactive cannabidiol prevents prion accumulation and protects neurons against prion toxicity. Journal of Neuroscience, 27(36), 9537-9544. Malfait, A. M., Gallily, R., Sumariwalla, P. F., Malik, A. S., Andreakos, E., Mechoulam, R., & Feldmann, M. (2000). The nonpsychoactive cannabis constituent cannabidiol is an oral anti-arthritic therapeutic in murine collagen-induced arthritis. Proceedings of the National Academy of Sciences, 97(17), 9561-9566. Specter, S., Lancz, G., & Hazelden, J. (1990). Marijuana and immunity: tetrahydrocannabinol mediated inhibition of lymphocyte blastogenesis. International journal of immunopharmacology, 12(3), 261-267. Klein, T. W., Kawakami, Y., Newton, C., & Friedman, H. (1991). Marijuana components suppress induction and cytolytic function of murine cytotoxic T cells in vitro and in vivo. Journal of Toxicology and Environmental Health, Part A Current Issues, 32(4), 465-477. McCoy, K. L., Gainey, D., & Cabral, G. A. (1995). delta 9-Tetrahydrocannabinol modulates antigen processing by macrophages. Journal of Pharmacology and Experimental Therapeutics, 273(3), 1216-1223. Coffey, R. G., Yamamoto, Y., Snella, E., & Pross, S. (1996). Tetrahydrocannabinol inhibition of macrophage nitric oxide production. Biochemical pharmacology, 52(5), 743-751. Formukong, E. A., Evans, A. T., & Evans, F. J. (1988). Analgesic and antiinflammatory activity of constituents ofCannabis sativa L. Inflammation, 12(4), 361-371. Watzl, B., Scuderi, P., & Watson, R. R. (1991). Marijuana components stimulate human peripheral blood mononuclear cell secretion of interferon-gamma and suppress interleukin-1 alpha in vitro. International journal of immunopharmacology, 13(8), 1091-1097. Srivastava, M. D., Srivastava, B. I. S., & Brouhard, B. (1998). Δ9 tetrahydrocannabinol and cannabidiol alter cytokine production by human immune cells. Immunopharmacology, 40(3), 179-185. Pan, H., Mukhopadhyay, P., Rajesh, M., Patel, V., Mukhopadhyay, B., Gao, B., ... & Pacher, P. (2009). Cannabidiol attenuates cisplatin-induced nephrotoxicity by decreasing oxidative/nitrosative stress, inflammation, and cell death. Journal of Pharmacology and Experimental Therapeutics, 328(3), 708-714. Mecha, M., Feliú, A., Iñigo, P. M., Mestre, L., Carrillo-Salinas, F. J., & Guaza, C. (2013). Cannabidiol provides long-lasting protection against the deleterious effects of inflammation in a viral model of multiple sclerosis: a role for A2A receptors. Neurobiology of disease, 59, 141-150. Notcutt, W., Langford, R., Davies, P., Ratcliffe, S., & Potts, R. (2012). A placebo-controlled, parallel-group, randomized withdrawal study of subjects with symptoms of spasticity due to multiple sclerosis who are receiving long-term Sativex®(nabiximols). Multiple Sclerosis Journal, 18(2), 219-228. Woerly, S., Marchand, R., & Lavallée, G. (1991). Interactions of copolymeric poly (glyceryl methacrylate)-collagen hydrogels with neural tissue: effects of structure and polar groups. Biomaterials, 12(2), 197-203. Wade, D. T., Collin, C., Stott, C., & Duncombe, P. (2010). Meta-analysis of the efficacy and safety of Sativex (nabiximols), on spasticity in people with multiple sclerosis. Multiple Sclerosis Journal, 16(6), 707-714. Brady, C. M., DasGupta, R., Dalton, C., Wiseman, O. J., Berkley, K. J., & Fowler, C. J. (2004). An open-label pilot study of cannabis-based extracts for bladder dysfunction in advanced multiple sclerosis. Multiple Sclerosis Journal, 10(4), 425-433. Barnes, M. P. (2006). Sativex®: clinical efficacy and tolerability in the treatment of symptoms of multiple sclerosis and neuropathic pain. Expert opinion on pharmacotherapy, 7(5), 607-615. Leung, L. (2011). Cannabis and its derivatives: review of medical use. The Journal of the American Board of Family Medicine, 24(4), 452-462. Grotenhermen, F., & Müller-Vahl, K. (2012). The therapeutic potential of cannabis and cannabinoids. Deutsches Ärzteblatt International, 109(29-30), 495. Kwiatkoski, M., Guimaraes, F. S., & Del-Bel, E. (2012). Cannabidiol-treated rats exhibited higher motor score after cryogenic spinal cord injury. Neurotoxicity research, 21(3), 271-280. Chagas, M. H. N., Zuardi, A. W., Tumas, V., Pena-Pereira, M. A., Sobreira, E. T., Bergamaschi, M. M., ... & Crippa, J. A. S. (2014). Effects of cannabidiol in the treatment of patients with Parkinson’s disease: an exploratory double-blind trial. Journal of Psychopharmacology, 28(11), 1088-1098. Iuvone, T., Esposito, G., De Filippis, D., Scuderi, C., & Steardo, L. (2009). Cannabidiol: a promising drug for neurodegenerative disorders?. CNS neuroscience & therapeutics, 15(1), 65-75. Fernández‐Ruiz, J., Sagredo, O., Pazos, M. R., García, C., Pertwee, R., Mechoulam, R., & Martínez‐Orgado, J. (2013). Cannabidiol for neurodegenerative disorders: important new clinical applications for this phytocannabinoid?. British journal of clinical pharmacology, 75(2), 323-333. Yamaori, S., Kushihara, M., Yamamoto, I., & Watanabe, K. (2010). Characterization of major phytocannabinoids, cannabidiol and cannabinol, as isoform-selective and potent inhibitors of human CYP1 enzymes. Biochemical pharmacology, 79(11), 1691-1698. Yamaori, S., Maeda, C., Yamamoto, I., & Watanabe, K. (2011). Differential inhibition of human cytochrome P450 2A6 and 2B6 by major phytocannabinoids. Forensic Toxicology, 29(2), 117-124. Yamaori, S., Okamoto, Y., Yamamoto, I., & Watanabe, K. (2011). Cannabidiol, a major phytocannabinoid, as a potent atypical inhibitor for cytochrome P450 2D6. Drug Metabolism and Disposition, dmd-111. Yamaori, S., Ebisawa, J., Okushima, Y., Yamamoto, I., & Watanabe, K. (2011). Potent inhibition of human cytochrome P450 3A isoforms by cannabidiol: role of phenolic hydroxyl groups in the resorcinol moiety. Life sciences, 88(15-16), 730-736. Koch, M., Dehghani, F., Habazettl, I., Schomerus, C., & Korf, H. W. (2006). Cannabinoids attenuate norepinephrine‐induced melatonin biosynthesis in the rat pineal gland by reducing arylalkylamine N‐acetyltransferase activity without involvement of cannabinoid receptors. Journal of neurochemistry, 98(1), 267-278. Jenny, M., Santer, E., Pirich, E., Schennach, H., & Fuchs, D. (2009). Δ9-Tetrahydrocannabinol and cannabidiol modulate mitogen-induced tryptophan degradation and neopterin formation in peripheral blood mononuclear cells in vitro. Journal of neuroimmunology, 207(1-2), 75-82. Takeda, S., Usami, N., Yamamoto, I., & Watanabe, K. (2009). Cannabidiol-2', 6'-dimethyl ether, a cannabidiol derivative, is a highly potent and selective 15-lipoxygenase inhibitor. Drug Metabolism and Disposition. Usami, N., Yamamoto, I., & Watanabe, K. (2008). Generation of reactive oxygen species during mouse hepatic microsomal metabolism of cannabidiol and cannabidiol hydroxy-quinone. Life sciences, 83(21-22), 717-724. Pertwee, R. G., Howlett, A. C., Abood, M. E., Alexander, S. P. H., Di Marzo, V., Elphick, M. R., ... & Mechoulam, R. (2010). International Union of Basic and Clinical Pharmacology. LXXIX. Cannabinoid receptors and their ligands: beyond CB1 and CB2. Pharmacological reviews, 62(4), 588-631. Graviola is a large tropical tree with a rich history of traditional use for conditions like cancer, parasitic infection, insomnia, and dysentery. Modern use remains very similar, mainly focusing on tension headaches and muscle aches, insomnia, diabetes, cancer, hypertension, and parasitic infection. Although the entire plant has been used as medicine by various traditional medical systems, the most common form the plant is available in today is as a leaf extract, and raw leaves intended for tea. Graviola is gaining in popularity outside worldwide as a general health supplement, blood sugar regulator, and anticancer agent. As a result it is getting easier to find the herb as time goes on. It is likely this tea will become a staple in Western herbal medicine in the coming years. Caution advised in combination with other hypoglycemic drugs due to potential additive effect. Graviola is mainly used as an adjunctive treatment for cancer, especially leukemia and other haematological cancers, as well as prostate, colon, and breast cancers. Graviola is also popular as an antidiabetic herb, and can be used to reduce hypertension, especially in combination with diabetes or metabolic syndrome. Graviola is a potent antiparasitic, useful for a wide range of different parasitic species, including worms, protozoa, and bacterial parasites. Graviola originated from South America and/or the Carribean. All parts of the plant were used as medicine for a wide range of conditions. The most common use of the plant appears to involve cancer treatment and parasitic infection. The darkest leaves on the plants were used primarily as a sedative or antispasmodic. They were used to treat insomnia, arthritic pains, colic, dysentery, muscle aches, headaches, and diabetes. The leaves were often placed inside a pillow or bedsheets to improve sleep. In Brazil, the leaves were made into a tea for treating various liver conditions. The oil of the leaves and unripe fruits were used topically for treating neuralgia, and arthritis. In Peru, the leaves were used to treat excess catarrh, and the bark and root were used for treating diabetes, insomnia, and muscle aches. In Guyana, the leaves were used as a heart tonic. In Southeast Asia, graviola was an important treatment for malaria. It was made into candies, ice cream, and syrups for treating malaria and other parasites. Graviola is a large tree, growing to a height of 10m. It requires high humidity, warm weather, and high annual rainfall in order to thrive. It produces large, edible fruits with an acidic taste (hence the common name soursop). There are over 130 different genera in the Annonaceae family, and around 2300 different species. The Annona genus itself has about 70 different species. Annona muricata is the most commonly grown worldwide. There are over 100 annonaceous acetogenins in the plant, which are considered to be the primary active constituents of the plant. Structurally these chemicals are derivatives of long chain (C35 or C37) fatty acids. These compounds are cytotoxic against tumour cell lines, and molluscicidal. Graviola is also rih in alkaloids, saponins, terpenoids, flavonoids, coumarins, lactones, anthraquinones, tannins, cardiac glycosides, phenols, and phytosterols. Graviola is useful for parasitic infection, including protozoan, and helminth parasites. It's used as a mild sedative and antispasmodic, and can be very useful for gastrointestinal inflammation and dysbiotic conditions. Graviola is also a popular treatment for diabetes by slowing lipid peroxidation, and restoring islet beta-cells in the pancreas. It's commonly used as an adjunctive treatment of cancer, especially haematological cancers and colon cancer. Graviola has been reported to increase symptoms of Parkinson's Disease. Moghadamtousi, S. Z., Fadaeinasab, M., Nikzad, S., Mohan, G., Ali, H. M., & Kadir, H. A. (2015). Annona muricata (Annonaceae): a review of its traditional uses, isolated acetogenins and biological activities. International journal of molecular sciences, 16(7), 15625-15658. De Sousa, O. V., Vieira, G. D. V., De Pinho, J. D. J. R., Yamamoto, C. H., & Alves, M. S. (2010). Antinociceptive and anti-inflammatory activities of the ethanol extract of Annona muricata L. leaves in animal models. International journal of molecular sciences, 11(5), 2067-2078. Torres, M. P., Rachagani, S., Purohit, V., Pandey, P., Joshi, S., Moore, E. D., ... & Batra, S. K. (2012). Graviola: a novel promising natural-derived drug that inhibits tumorigenicity and metastasis of pancreatic cancer cells in vitro and in vivo through altering cell metabolism. Cancer letters, 323(1), 29-40. Coria-Tellez, A. V., Montalvo-Gónzalez, E., Yahia, E. M., & Obledo-Vázquez, E. N. (2016). Annona muricata: A comprehensive review on its traditional medicinal uses, phytochemicals, pharmacological activities, mechanisms of action and toxicity. Arabian Journal of Chemistry. Gavamukulya, Y., Abou-Elella, F., Wamunyokoli, F., & AEl-Shemy, H. (2014). Phytochemical screening, anti-oxidant activity and in vitro anticancer potential of ethanolic and water leaves extracts of Annona muricata (Graviola). Asian Pacific journal of tropical medicine, 7, S355-S363. Arroyo, J., Martínez, J., Ronceros, G., Palomino, R., Villarreal, A., Bonilla, P., ... & Quino, M. (2009, September). Efecto hipoglicemiante coadyuvante del extracto etanólico de hojas de Annona muricata L (guanábana), en pacientes con diabetes tipo 2 bajo tratamiento de glibenclamida. In Anales de la Facultad de Medicina (Vol. 70, No. 3, pp. 163-167). UNMSM. Facultad de Medicina. Adewole, S., & Ojewole, J. (2009). Protective effects of Annona muricata Linn. (Annonaceae) leaf aqueous extract on serum lipid profiles and oxidative stress in hepatocytes of streptozotocin-treated diabetic rats. African journal of traditional, complementary and alternative medicines, 6(1). Adeyemi, D. O., Komolafe, O. A., Adewole, O. S., Obuotor, E. M., Abiodun, A. A., & Adenowo, T. K. (2010). Histomorphological and morphometric studies of the pancreatic islet cells of diabetic rats treated with extracts of Annona muricata. Folia morphologica, 69(2), 92-100. Adewole, S. O., & Caxton-Martins, E. A. (2006). Morphological changes and hypoglycemic effects of Annona muricata linn. (annonaceae) leaf aqueous extract on pancreatic β-cells of streptozotocin-treated diabetic rats. African Journal of Biomedical Research, 9(3). Lavender is one of the most famous herbs known to man. It's cultivated on a massive scale throughout Europe and North America, and is a popular flavouring and aromatic agent for household products. Medicinally lavender is best known for its ability to pomote sleep. It's often sold as aromatherapy, in salves and creams, and incense for this purpose. Lavender is also great for internal use, where it interacts with the GABA system to produce relaxation and sleep. Levender essential oil is common as a topical agent for insect bites, rashes, and infection. Lavender is mainly used in topical applications for rashes, skin irritations, mild infections, sunburn, and insect bites. Internally it's mainly used for anxiety-related conditions, GIT inflammation and discomfort, and insomnia. Lavender is a member of the mint family (Lamiaceae). In the genus Lavandula there are approximatly 47 species. Most of these perennials, or small shrubs. There are a number of lavenders used medicinally. This list is disputed by many taxonomists, suggesting that French lavender may be Lavandula stoechas or Lavandula dentata, and that Spanish lavender could be either Lavandula dentata, or Lavandula lanata, or Lavandula dentata. Lavender is useful topically for female conditions including dysmenorrhoea and PMS due to its antispasmoduc and analgesic effects. It's also useful topically for its antifungal and antibacterial effects. Internally lavender can be used for gastrointestinal complaints, including bloating, flatulence, and colic. Lavender is a reliable nervine for its GABAergic activity. Additionally it has been shown to reverse the stimulating effects induced by caffeine, and inhibits acetylcholine release. Lavender has been proven to be a very safe herb with a low incidence of adverse effects. Avoid use with pharmaceutical sedatives due to the possibility of agonistic synergy. Passionflower has many uses, and comes in many different varieties. It's main uses are for anxiety-related disorders of all kinds. Bacopa is a popular herb for improving cognitive function. It improves the formation and retrieval of memories, as well as concentration and focus.